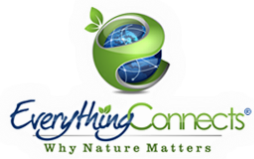 With unlimited resources and near zero pollution, renewable resources, such as solar and wind power, create electricity by harnessing the power of natural cycles and systems turning the omnipresent energy around us into usable, sustainable forms while producing little or no pollution, reducing global warming emissions to almost zero, maintaining a strong, sustainable green economy, attaining energy independence, using up to 15 times less water than coal and nuclear power and allowing the health of people, wildlife and ecosystems to recover after hundreds of years of extracting and burning fossil fuels. According to a study published in Springer’s Journal of Environmental Studies and Sciences, solar and wind power cost less than coal-fired power plants when climate change costs and other health impacts are factored in and as the UN states, "Renewable energy can play an important role in a comprehensive global strategy to eliminate energy poverty. In addition to being environmentally unsustainable, the current energy system is also highly inequitable, leaving 1.4 billion people without access to electricity and 2.7 billion dependent on traditional biomass for cooking. Many developing countries have a rich endowment of renewable energy that can help meet this need." In the United States, a study by the National Renewable Energy Laboratory of renewable energy’s technical potential finds that every state in the nation has the space and resources necessary to generate clean energy and procure the benefits of renewable energy standards. According to the Energy Information Administration (see also), the U.S. can create jobs, despite the media myth of job killing regulations, increase renewable energy generation, improve air quality across the country, and reduce our carbon dioxide pollution - all at effectively zero cost to our economy by adopting a strong national clean energy standard - something that 29 states have already done and are benefiting from. The majority of Americans believe “the U.S. needs to be a clean energy technology leader and it should invest in the research and domestic manufacturing of wind, solar, and energy efficiency technologies.” In Australia, renewable energy is already cheaper than fossil fuels. 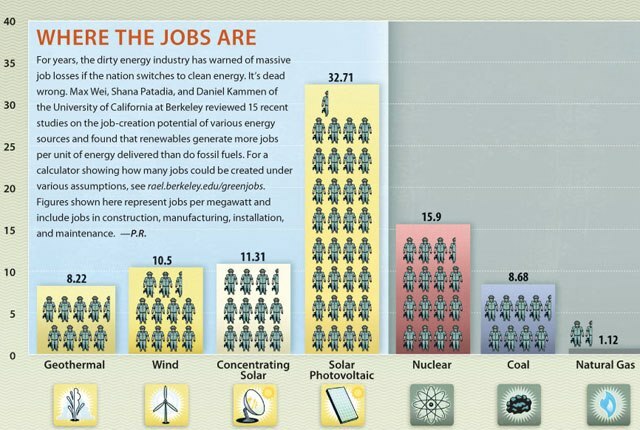 Even back in 2001 before clean energy really took off, a Renewable Energy Policy Project report found that wind and solar photovoltaic investments lead to at least 40% more jobs per dollar than coal and with the highest documented rate of return of any U.S. federal program, clean energy is more than just clean - it's money smart. The stakes couldn't be higher - if fossil fuel infrastructure is not rapidly changed, the world is headed for irreversible climate change in just five years, according to the International Energy Agency. Learn more. Solar Energy Solar power is one of the cleanest, most abundant forms of energy. It emits zero greenhouse gases or other pollutants, uses no water, produces no waste and offers significant potential for short- and long-term climate change mitigation. Wind Energy Wind power is one of the most cost-effective sources of electricity available. Discover the benefits, challenges and future of wind. Geothermal Power Geothermal energy comes from the heat beneath the Earth's surface, from large and complex power stations to small and relatively simple pumping systems. Bioenergy Bioenergy, consisting of biomass, biofuels and biogas, is a renewable energy derived from biological sources, such as plant material and animal waste, which store sunlight in the form of chemical energy that can be harnessed to generate electricity, supply heat and produce biofuels. All renewable energy sources provide 3078 times the current global energy needs. Learn more. Is renewable energy too expensive? Can renewables provide baseload power? 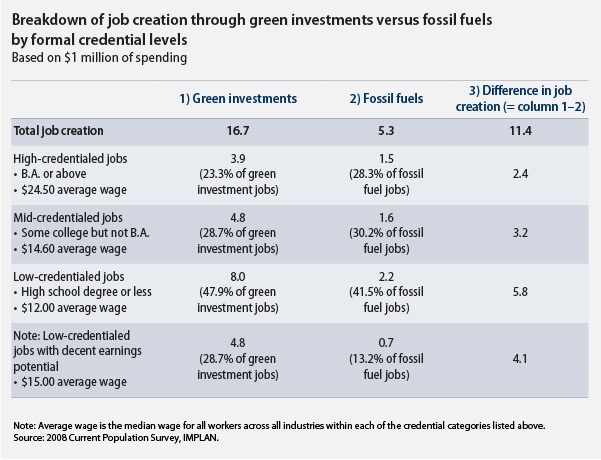 Does renewable energy investment kill jobs? what's wrong with our current energy system?